Another Norwegian joining in, sharing my build and hoping for some input`s and tips as i go ahead! Post nr 2 has complete mod list. 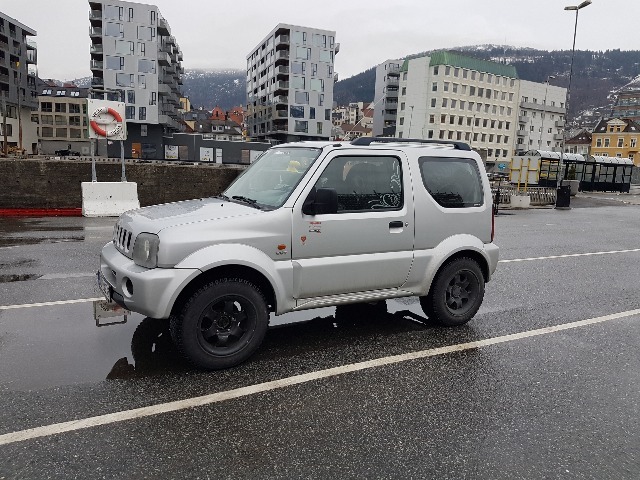 I`m farly new on this forum, and all new to the suzuki scene..
Bought a little jimny recently, after having owned landcruiser`s (even a artic truck 37"), a swb patrol Y61 TD42t, and a ton of different cars from VW`s to M3`s.. I`m "grown up" (on paper), 40y old with kids, and been into cars and motor`s as long as i can remember. Built several high power streetcars etc. But it`s time to go a different direction now! Something more affordable, that can be used for more offroading. The Jimny was bought to have as a second car, semi-daily driven, with plans for bigger tires, minor lift kit and all the standard stuff. Plans where to stay in a low-ish budget (read: not 35"`s turbo, and portal axles lol) , but still put in money where needed to get it really capable and fun to own. The car is according to it`s registration papers, a late 2006 car (might have been sitting around for a while? ), a VVT manual gear with aircondition. 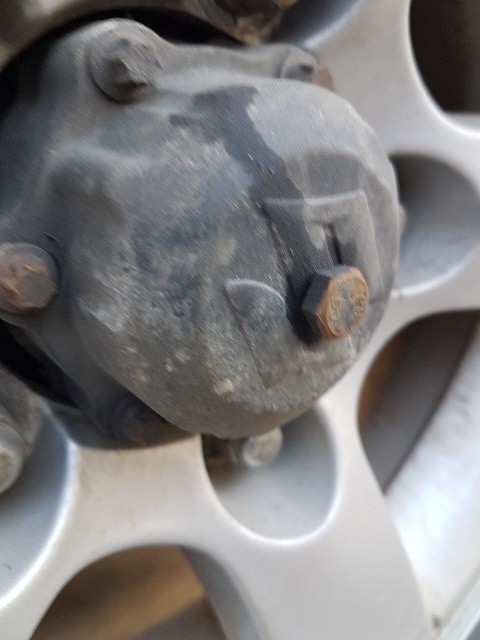 92000km , and pretty much no rust to be found! Underbody treated when new , good for me. Bough recently by myself for cheap, as it had a noisy R72 gearbox and some other minor issues. Perfect for me to keep budget down, as i am changing out alot of the parts anyway. Some scratches here and there, but pretty much dent free . Basicly completly stock technically. Here`s the car from the day i got it, with crappy painted wheels and a need for a "cosmetic intervention"
One of the issues with the car, was grinding front hubs.. So i ripped them off when i got there, and drove home without them installed. Fixed a temporary solution when i got home, just to permanently lock them in, to have 4x4 available in the snow conditions we had. 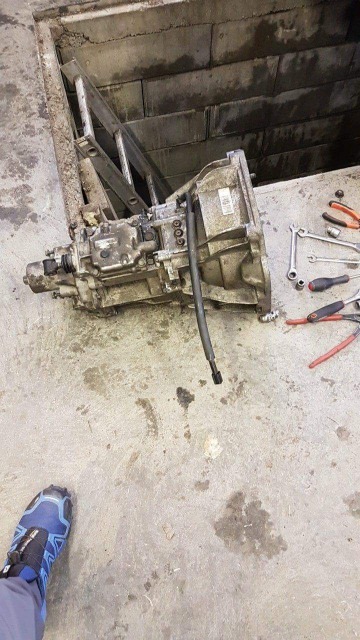 Gearbox was up next, fix it before carnage. Typical bearing noise in 2nd, 3rd and 4th gear, not much but very noticable. Bought a rebuildkit from ebay, great package btw, and pulled the gearbox out. Had a buddy to help me press bearings, as i dont have a press. Everything was easy to press though, rarely over 1t pressure to remove them. Box back in, noise free all good! I also had plans of doing a M16a swap at the time, but couldnt find a motor i wanted when the box was out. 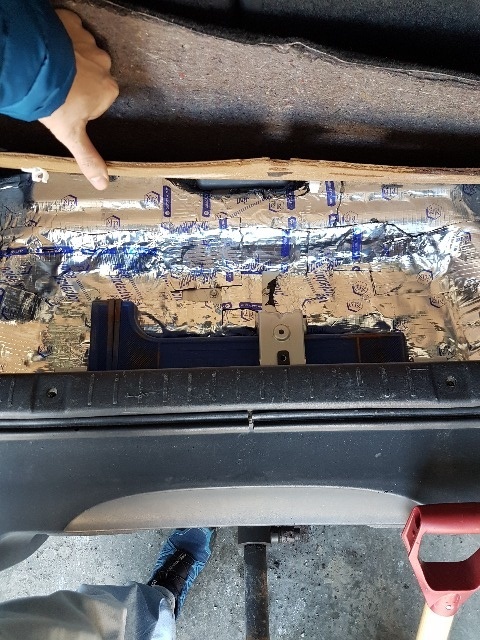 Jimny is a bit noisy inside, si i ripped out the rear seats and panels, to put in noise cancelling mats i bought at a car stereo shop.. Covered the entire floor, rear wheel wells and inside of rear sidepanels.. Big differense in general noise from the rear! No good pictures, just one from the rear well after job done. I need a new airfilter box though, previous owner had a thing for open filters it seems. No new pictures from the outside right now as i`m away for work for acouple weeks, but there will be before/after pics of the lift/wheel install when i get home! Next post, further mod plans! Last edit: 03 Jan 2019 07:03 by OlaGB. Modifications.. Plans, and updated info on what has been done. Most/all mods are listed and updated in this post, to keep track of everything done. It has been many many hours of reading. Alot of opinions to consume, but i think i sorted out most of it and found what suited me best. As i chose to buy a VVT car, there was desicions to be made regarding driveline, and ratios. 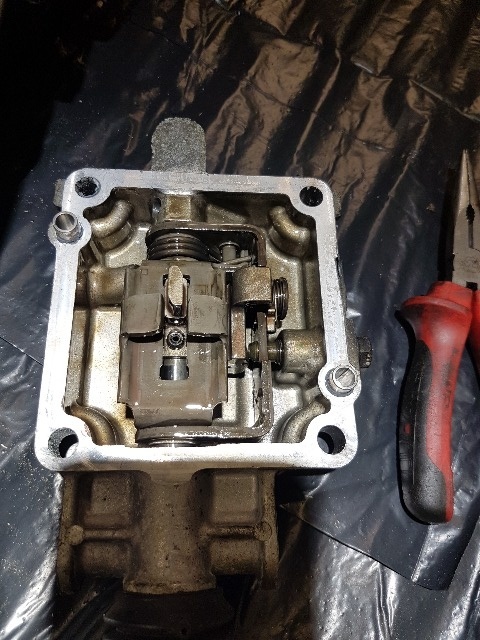 Motor swap isnt as easy to get perfect either (due to high comp in VVT M16`s and me wanting it done the best way i can). I also would like to run 95oct instead of 98oct due to availability. - M16 swap. Preferably a Swift Sport motor. Update: Went for a 2007 SSS motor! The SSS motor will also get a M18 intake and throttlebody! 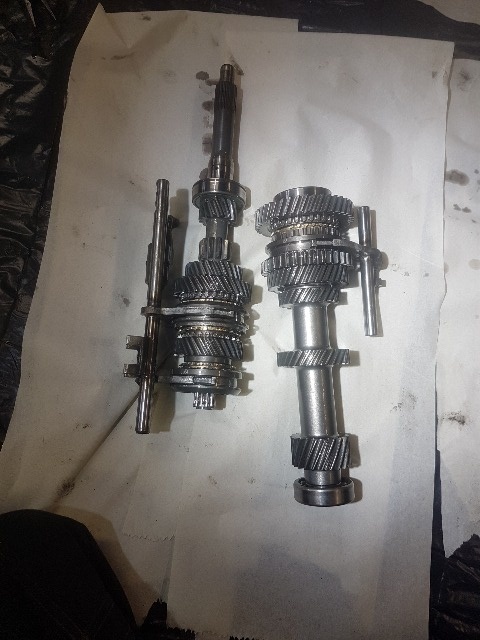 -Trail gear 3.74/1.17 ratio transfer gears.. The VVT model transferbox has the stronger chain, and trail-gear tech`s claimed very little issues with it. Atleast when only running 29" wheels. This way i get to keep the push button which i like, and the gear ratios are better for my taste than running rocklobster 4.16 on a pre VVT jimny. 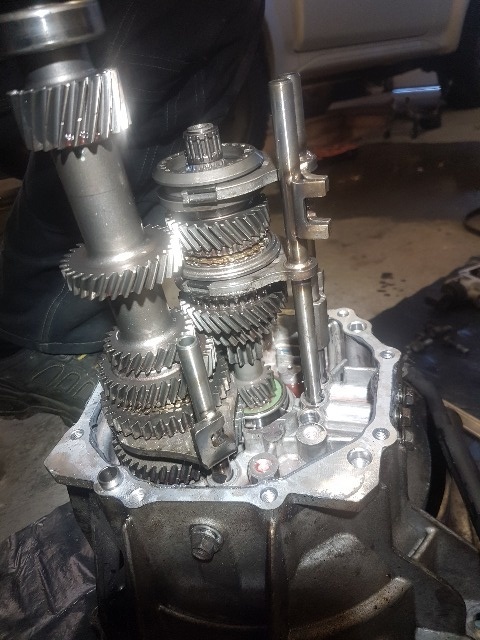 In comparison, this gives me lower lowrange by about 15-20%, and 5-6% higher highrange (calulated final gearing, as VVT has differend gear and diff ratios)..
- JB HD transferbox mount + HD bushes. Installed -HD bushes, way to much noise, went for new Suzuki mounts. - Winch.. A 8000lbs wire winch , might go syntetic later on. Wireless remote. Jimnybits winch mount with tow points. - 7x15" ET15 black steel wheels ordered, and i`ve bought BF MT 235/75-15`s. - Trailmaster 2" comfort lift kit, TUV approved for MOT reasons. - Trailmaster steering damper, TUV approved for MOT reasons. - Longer brake lines front and rear, trailgear. -Castor correction bushes + new type OEM upgrade rear radius arm bushes. - Repositioner brackets for rear shocks with through hole bolts. Bought, not installed, conflicts with towbar. - Battery and alternator upgrade. Last edit: 03 Jan 2019 07:00 by OlaGB. Decision on motor has been made, and the 2007 sport motor is bought! 125hp/150nm motor, with approx same km as my car, 90k km. I dont care much for running it semi-ok mapped as i want it to run just as good as stock, so i`m probably going full remap. Need to decide if i`m keeping the stock exhaust header vs 4-2-1, and maybe other mods before spending the money on remap. Might be upgrading clutch as well, any thoughts? Is it worth spending 3 times the money on the safari tough exedy, or just buy a stock exedy? I'm currently building a 2008 SSS M16A VVT for my trayback project......nothing is cheap lol almost everything is very expensive. Spot on. The swift was my choice as well. I had to use the jimny inlet and exhaust manifolds, which means 125bhp is unlikely im afraid (especially on the standard 1.3 ecu). The swift is transverse mounted so has odd shaped manifolds, which wont work in a jimny. Its also drive-by-wire, so has an electronic throttle body made of cheese. Keithy wrote: I'm currently building a 2008 SSS M16A VVT for my trayback project......nothing is cheap lol almost everything is very expensive. Are you going all in, rods pistons etc for turbocharging ? Any mods planned for the driveline? Expensive is relative, and im not going for a lowbudget build at all, just want to do it "cost efficent"
Riccy wrote: Spot on. The swift was my choice as well. I had to use the jimny inlet and exhaust manifolds, which means 125bhp is unlikely im afraid (especially on the standard 1.3 ecu). The swift is transverse mounted so has odd shaped manifolds, which wont work in a jimny. Its also drive-by-wire, so has an electronic throttle body made of cheese. Both you guys has very nice builds going on, keep on updating, i enjoy reading about it! I've just got a 2012 sss m16a which will be going in when I'm back off my hols. I've dine quite a few 1.6 swaps but as the 2012 is supposed to be 138 bhp I'm looking forward to this one. j999pre wrote: I've just got a 2012 sss m16a which will be going in when I'm back off my hols. I've dine quite a few 1.6 swaps but as the 2012 is supposed to be 138 bhp I'm looking forward to this one. Yeah, i was looking for the 136-138hp as well, but almost impossible to find around here, + very high prices. What are you planning to do on intake and exhaust? This came out today, what 1.6 would this be with 103hp? 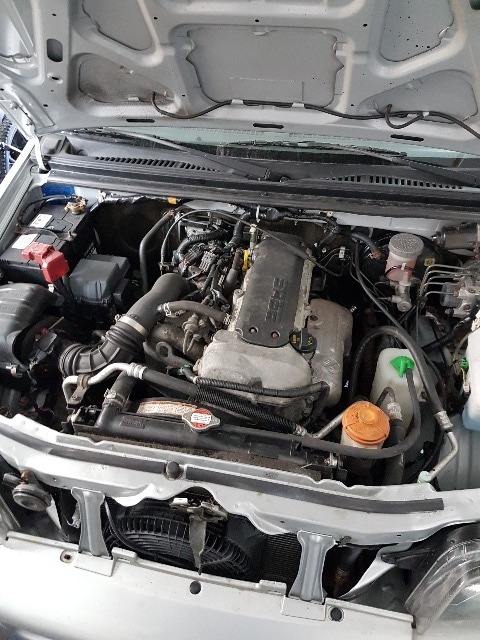 Has to be a Liana 2004 non-VVT. Other suzuki m13a engines cost double that of Lianas in Norway for some reason. I have no idea why he says it is 103hp. Yes, he bought a Liana motor.. No idea about the 103hp.